If you’ve been following energy news in Africa, you are probably aware that East Africa is experiencing a bit of an oil and gas rush. In addition to the discoveries of oil deposits in Puntland and in the Lake Turkana region of Kenya, there have also been discoveries of about 100 trillion cubic feet (tcf) of recoverable natural gas deposits both onshore and off the coasts of Tanzania and Mozambique. As Kenya’s coastline shares the same geological formation as some of the exploration blocks off the coasts of countries further south, there are increasing hopes that Kenyan waters may provide similar discoveries of fossil fuel deposits in the years to come. However, the prospects for oil or gas exploration off the coast of Kenya have called attention to the lack of a demarcated maritime boundary between Kenya and Somalia. 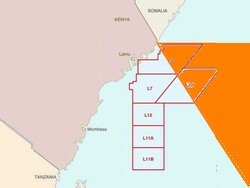 Earlier this month, Somalia’s Transitional Federal Government (TFG) challenged Kenya’s attempts to award offshore exploration blocks to Total and Eni. Somalia’s rationale for its complaint is that some of the exploration blocks lie in an area where the maritime boundary has not been demarcated – and where both countries claim ownership of these waters. Kenya, on the other hand, rejects that ownership of these blocks is contested, and believes there is no reason to hold up the award of licenses. In order for this issue to be resolved, Kenya and Somalia would have to agree on where the border should be demarcated and sign a treaty to that effect. However, this may be unlikely until Somalia has a permanent government and is able to address other political, economic, and security issues that would compete for the government’s attention. At stake are approximately 38,000 km2 (23,600mi2) of maritime territory over which both countries assert the legal claims to sell rights for oil exploration and collect revenue from any discoveries. The timing of this maritime boundary dispute is particularly interesting for two reasons. First, it is a particularly inopportune time for Kenya to have a financial stake in where the boundary lies, given that it is currently involved in military operations in southern Somalia in the area adjacent to disputed waters. This is made worse by the earlier rumors that Kenya sought a “buffer zone” in that region. Nonetheless, I would be surprised if Kenya’s motivation to invade southern Somalia was tied to its future aspiration to award offshore exploration licenses. Second, this dispute between Kenya and Somalia may be the first of many similar disputes in the region if Somalia is able to reclaim a voice in regional issues. These disputes may be over trans-border natural resource deposits (as in the case with Kenya), or even over issues such as water rights and dam construction (between Ethiopia and Somalia). i think both side should talk.